Home Security Civil Security ISS: Are West Africa’s gunsmiths making violence cheap? The trafficking and illicit circulation of small arms and light weapons are often discussed in the context of fuelling instability and insecurity in West Africa. Rarely, however, is the issue of locally manufactured weapons given appropriate attention in these conversations. The production of firearms by local artisans is not new to the region. It has existed in many countries – including Benin, Burkina Faso, Côte d’Ivoire, Guinea, Liberia, Mali, Nigeria, Senegal, Sierra Leone and Togo – for decades, and in Ghana for centuries. Over time, local manufacturers’ knowledge has improved and the level of activity seems to have increased. Firearm production, and the dynamics that shape it, vary considerably from one country to another. The little empirical research available provides a glimpse into it in some countries – for example Ghana, Côte d’Ivoire, Benin, Togo and Nigeria. Studies describe an artisanal, informal and mainly clandestine industry, animated by blacksmiths whose knowledge is passed on to the next generation, and occasionally to apprentices. The homemade weapons found in West Africa are typically rudimentary, and are often duplicates of existing firearms. They include pistols, shotguns (including single-barrel and double-barrel), automatic rifles and ammunition. In countries such as Ghana, blacksmiths are even able to reproduce – at least in appearance – assault weapons, such as the AKM; a version of the AK-47. Manufacture is mainly demand-driven, with hunters being the main clients. However, there is a lack of transparency and control of weapons sales in the region, and some arms end up in the hands of criminals. The demand can be local, national or regional (such as when arms are smuggled into neighbouring countries). Not all blacksmiths have full-scale production skills; most seem involved only in repairing and assembling firearms. Arms are repaired or manufactured using various metals from used tools that are melted, recycled and repurposed. Gunsmithing is only one facet – but the most profitable – of what blacksmiths do. They also manufacture other items such as kitchen utensils and farming tools, and hide firearm production behind this legal trade and income stream. Homemade – more so than imported – firearms fuel banditry, organised crime, inter-communal conflicts and clan and political rivalries. These arms are also relatively inexpensive (US$15 to US$120 in Ghana and US$90 to US$150 in Côte d’Ivoire, depending on the type and level of technicality). The weapons are not sophisticated, but they are dangerous, and are used in serious crimes. 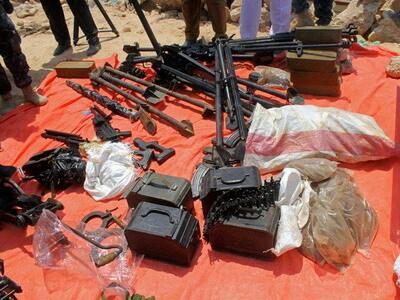 When the police arrested a group in the northern state of Kaduna, Nigeria, in August in connection with kidnapping for ransom, they reportedly recovered weapons including three AK-47s and 10 locally made sub-machine guns. Over the past few months, kidnapping has taken on a dangerous dimension in several parts of Nigeria. In 2015, at a forum hosted in the south-eastern part of Nigeria by the Presidential Committee on Small Arms and Light Weapons, it was revealed that nearly 60% of the illegal arms circulating there were locally produced. In Ghana, almost 90% of firearms used in armed robberies are reportedly locally manufactured. In Benin, it was recently reported that most robberies on roads and in urban areas were carried out with locally manufactured weapons. Similarly in Mali, according to a 2010 report, some 80% of armed robberies and acts of banditry in urban areas were perpetrated with locally made firearms. In Ghana local gunsmiths are estimated to have the capacity to produce over 200 000 weapons annually. In Mali, according to 2010 data, it was close to 5 000 a year. But these figures aren’t based on an exhaustive inventory of gunsmiths, and so are probably too low. Nonetheless, they provide insight into the scale of the problem and its impact on security. Countries such as Burkina Faso, Ghana, Mali and Sierra Leone have started working with local manufacturers to better control their activities – mainly through a census of weapons producers and the creation of associations to bring together local manufacturers. This is in line with Articles 7, 8 and 12 of the Convention of the Economic Community of West African States (ECOWAS), which provide measures to control the manufacture of small arms and light weapons and to initiate dialogue with local manufacturers. Despite some progress, the results remain mixed. Across the region, there are manufacturers who are unwilling to participate in these efforts, and who continue to evade regulation. The industry is often illicit, and it keeps evolving, which makes it challenging to get up-to-date and accurate information. Efforts to identify, register and regulate gunsmiths should therefore be initiated and enhanced throughout the region. While the legal and regulatory mechanisms to do so exist in most countries in the region, implementation remains weak. To limit the manufacture of firearms, several countries have offered job training and alternative livelihoods to local gunsmiths. But gunsmithing is lucrative, and such programmes have not been very successful. Tougher approaches are needed to decrease local firearm manufacturing. If African leaders are serious about silencing the guns by 2020, they must take a closer look at locally manufactured weapons.